Russia has sent inspectors to Turkey. Russia has sent inspectors to Turkey to clarify the situation in the country's military-technological sphere amid reports that Turkey is shelling sites in Syria. 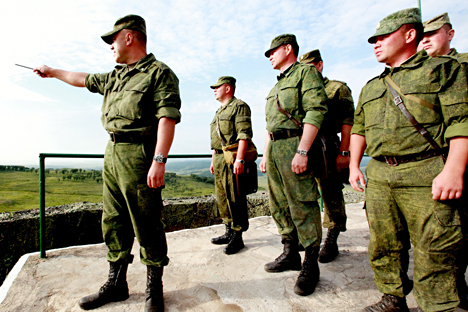 Moscow is using its right within the framework of the OSCE 2011 Vienna Document. As tensions between Moscow and Ankara continue to grow, a group of Russian inspectors is in Turkey evaluating the activity being carried out in the country's military sphere following allegations that Turkey is firing on targets inside Syria, where Russia’s air force is carrying out military operations against forces opposed to President Bashar al-Assad. The mission, which is being conducted within the framework of the OSCE (Organization for Security and Co-operation in Europe) Vienna Document signed in 2011, will allow the inspectors to check test sites and express their concern to Turkish military commanders. "Between Feb. 2 and 5, within the framework of the 2011 Vienna Document on the strengthening of trust and security, a group of Russian inspectors is carrying out an inspection of a specified zone on Turkish territory, which has a square area of 18,000 kilometers," said Sergei Ryzhkov, director of the Russian Center for Reducing Nuclear Danger. This week the Russian inspectors will also carry out an observatory flight over Turkey within the Open Sky Agreement. Ryzhkov explained that the inspection is taking place to determine the scale of military activity being conducted in Turkey, about which the country must notify the participants of the agreement, or to verify the absence of activity. The Vienna Document, within the framework of which the inspection is taking place, was adopted by the OSCE forum in 2011. The document's aim is to strengthen trust and security between participating countries, such as Austria, Armenia, Belarus, Belgium, Hungary, Germany, Greece, Spain, Canada, the Baltic states, the UK, the U.S., Ukraine and many others. The document serves as a consultation and cooperation mechanism in relation to unusual military activity and dangerous military incidents. "With the objective of increasing transparency, each country-participant can ask any other country-participant for clarification concerning information it presents," reads the document. Thus, if one of the participants "is preoccupied" about some unusual or unplanned activity, it can send the other country a request for clarification. The response must be given within 48 hours. Besides the "orange" level of threat announced by the Turkish armed forces, one of the reasons Russia submitted the request was that it alleged Turkey was firing on a number of Syrian territories. Russia also reported that the shelling had resulted in a number of victims.